My name is Nguyen Hoang Nguyen, although I am better known as Rosie Nguyen (my pen name). 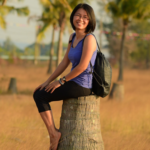 I am a book author, journalist and social advocate from Vietnam. My written works mainly focus on underexplored topics in Vietnam, for example, social issues facing Vietnamese youth today, positive you movements, youth development and life-long learning. I am very happy and honored to be selected as a participant of the 61th batch in IATSS Forum. To be honest, I have always been attracted to Japanese people, literature and culture since I first read the book An Encouragement of Learning by Fukuzawa Yukichi, whose ideas inspired me to embrace continuing education and social contribution. I have been to Japan for several times, including my backpacking trip to Honshu and Kyushu regions, and some tourism promotion programs. However, this time would be totally different as I would have the chance to learn more deeply about various aspects of Japanese culture, including and the essence of Japanese culture and philosophy, and cultural preservation. The theme sustainable community development perfectly suits my interests, as I am hosting and facilitating non-profit projects to create a trusting space for young people to engage and communicate, boosting community bonds. I am eager to study the marketing strategies for the One Village One Product movement to gain the insights and apply back to similar projects in Mekong Delta area. Additionally, I am excited to join the field study trips in Kobe, Yokkaichi and Iga and learn about their experiences in tackling complex problems that are arising in my country. The IATSS Forum would be a wonderful opportunity for me to sharpen my knowledge and skills, to learn and strive toward my goal as a community leader who contributes to the development of a learning society in Vietnam. I look forward to exchange ideas with other experts and emerging leaders, enhancing our collective leadership capacity, and create valuable relationships for future collaboration.